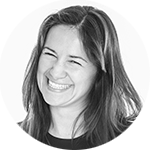 Story Creator: Time For Engaging & Interactive Content! Story Creator: Time For Engaging and Interactive Content! Basically, you should have done it some time ago, but if you’re reading this just now—get your act together, because your competitors will leave you far behind. Toss out dull and static content in favor of one that is engaging and interactive, and one that will get you more clicks, shares, conversions, and wider reach. 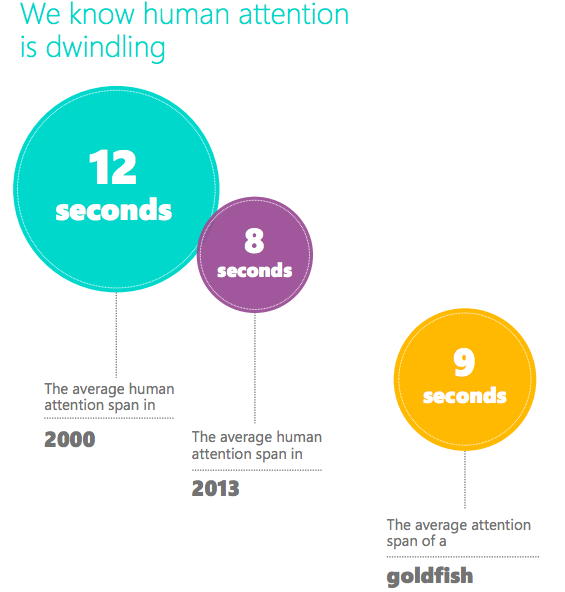 Some time ago, Microsoft found that since the year 2000 (or around the time when the mobile revolution began) the average attention span dropped from 12 seconds to eight seconds (source). Probably some of you, despite what all studies and statistics show, are still desperately holding on to simple and “clean” forms, with one lead photo at most and without unnecessary “disruptors” and “embellishments”. But the thing is that by not including any visual or interactive elements you will make your content stylish at best, but definitely not engaging. And your readers do enjoy pictures, graphics, infographics, surveys, studies, quizzes, tests, GIFs, videos, etc. For instance, did you know that in June 2016 Instagram had reached over 500 million users (source)? Or that every day Facebook users view 8 billion videos (source), while Snapchat users—10 billion? And that YouTube reaches more viewers aged 18+ during prime-time hours than any cable network (source)? In my last article for FreshMail “How to make press releases more attractive for tech-savvy journalists?” I mentioned Sarah Shepard, Business Wire’s regional VP for New York, who has recently held a presentation at Ragan Communications’ PR and Media Relations Summit in New York on creating multimedia press releases that gain traction. 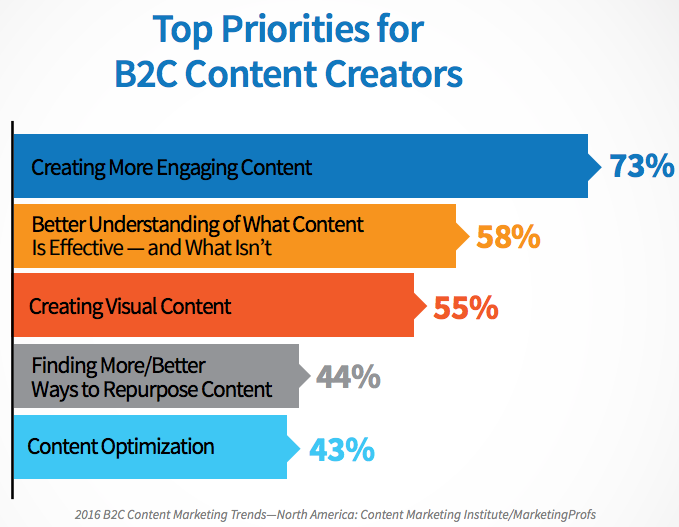 According to Shepard, it takes 20 touchpoints to convert a prospect, so adding multimedia elements to press releases increases the odds of higher traffic and viewers taking action. How much? 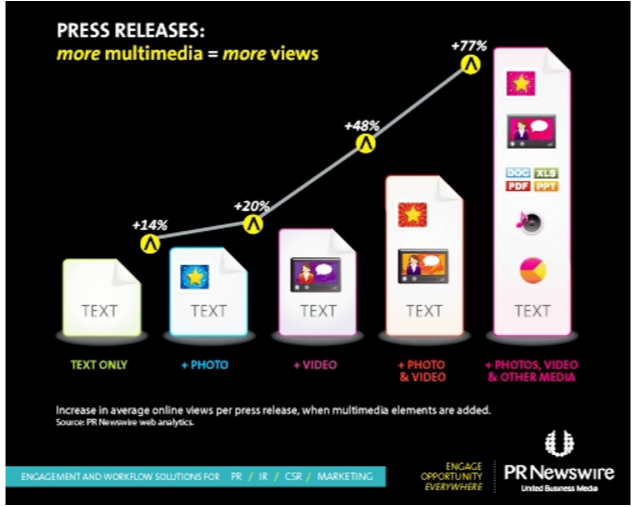 Press releases with visuals are shared about 3.5 times more often than plain text releases. In Story Creator—regardless of whether you take upon yourself to create a press release or a longer piece—you will be able to easily add (drag & drop) both your own and external visuals. Apart from the cover photo, which you should be selecting very carefully as it will constitute the main theme of your story, weave some other photos or a video which will add to your note something you haven’t quite captured into the content of your news. And while you’re at it, don’t forget—if your message is directed at journalists—to make selected materials available for download. Do you need to caption a picture downloaded from a stock photo library under the CC BY license? Just enter the author’s details in the field below the pic and each time they will be displayed in smaller font. Additionally, you can add a title to each photo. Would you like to cite a particular Facebook post or tweet? Just click on the Twitter or Facebook icon on the right sidebar of Story Creator and type in the search engine below the right nick, hashtag or fanpage name (depending on the channel). Our browser also allows you to search the Internet for GIFs: choose one that suits your needs, “grab” it and drag to a location of your liking. It is similar with videos (the vast YouTube and Vimeo library is at your disposal) or your other press releases, parts of which you wish to include. Trust me, this game of content has never been easier and more fun. Each of these multimedia elements can also be pasted in the body text using the embed code. It’s entirely up to you. – buzzsumo.com: in a study of more than one million articles, BuzzSumo found that features containing an image once every 75-100 words got twice as many shares in social media when compared to articles with fewer images. What do you gain from incorporating this concept in your activities? Interaction is our nature. It helps us better absorb and comprehend what’s new, learn and remember. A conversion study by Demand Metric indicates when examining “very effective” content, interactive blows away passive content for educating the buyer. 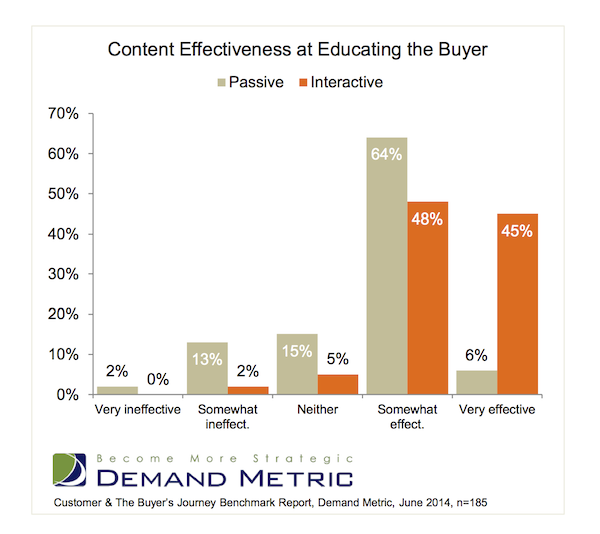 Pic: A conversion study by Demand Metric indicates when examining “very effective” content, interactive blows away passive content for educating the buyer. What types of interactive content can you use? Infographics with embedded questions, changing titles, etc.—example here. Ready to incorporate more visual and interactive content into your 2017 marketing strategy? Check how we can help you.